You can use Google Cloud Source Repositories to browse to a file in a repository. You can choose to view the latest version of the file, or select a specific version of the file by choosing a branch, tag, or commit. For most Git repositories, the latest version of a file refers to the last commit of the file in the master branch. You can view this version of a file from the Repository view. From the Breadcrumb toolbar, select Branch. Choose the branch you want to view. The view of the repository changes to reflect the selected branch. From the Breadcrumb toolbar, select Tag. Choose the tag you want to view. The view of the repository changes to reflect the selected tag. 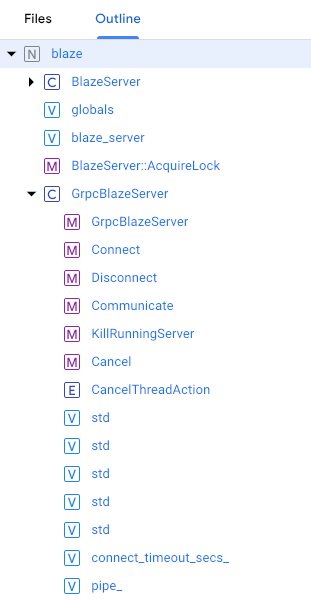 From the Breadcrumb toolbar, select Commit. Choose the commit you want to view. The view of the repository changes to reflect its state at the selected commit. In the file view, click the Outline tab in the left-hand side of the screen. Click an identifier to go to its starting location in the file.